Whenever I get the chance, I make the pilgrimage to Melbourne, or, more correctly, to Western Melbourne. The shrine I seek has nothing to do with religion, but it has a spirituality all of its own. I seek something no Sydneysider can find on their back door step, something no amount of Harbour Bridges and sunny (ish) days and schooners and middies can make up for. I seek…injera. For those of you who haven’t had the exquisite pleasure, injera is a large crumpet-like flatbread that forms the foundation (literally, it sits under all the other food, tablecloth-like) of Ethiopian and Eritrean food. Stews (wats) are daubed on top of it and you tear of bits of the injera and scoop them up by hand. It is traditionally made using teff flour and thus has a delicious sour flavour. On my most recent pilgrimage, I caught up with Lauren of Footscray Food Blog, which I’ve been reading and eating from ever since my brother moved to the outer edges of Footscray. She offered to meet up at ‘lovely local place’, Adis Abeba. I could almost smell the fresh sponges of injera and feel them squish between my teeth. I couldn’t wait. 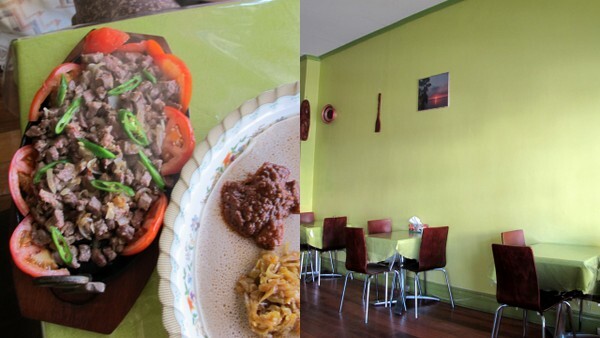 I arrived at the lime green Addis Abeba for our late lunch to find Lauren already there and no other customers. Lauren ordered (she’s the guru after all) and we proceeded to delve into talk about life, blogging and, of course food. The veggie combo was amazing. For $12 there are 6 delicious curry-like stews to scoop up and munch. As we eat, the injera underneath get deliciously steeped in juices. But don’t worry, we have a whole massive bowl of injera in case it gets too soggy. The other dish we order is the spacial tibs ($12), a gorgeous buttery lamb dish that comes out sizzling. We ladle it onto the platter as well, pinching up handfulls with the fresh injera. 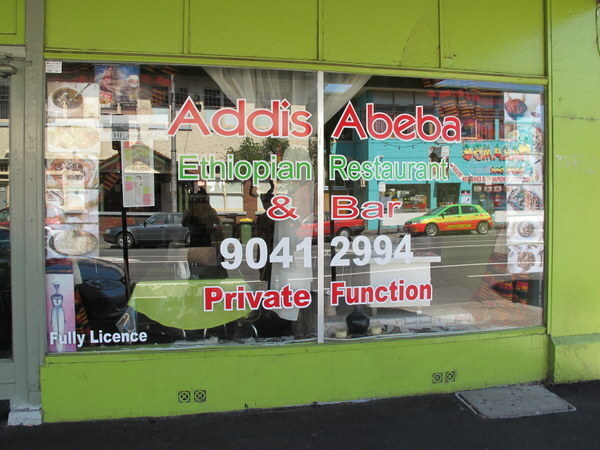 After my visit to Adis Abeba, I feel like I’ve graduated from Ethiopian food pilgrim to devotee. So much so that my brother and I return the next day and ordered the exact same dishes. And we also hit up Mesnoy Injera Bakery afterwards, so we could serve injera at bro’s house party. A big thankyou to Lauren Wambach for hosting me in her ‘hood. See Lauren’s post for a better description of the dishes we ate. What food would you travel halfway around the world, or at least across town, to savour?